Yesterday evening when the news hit our TV channels we were absolutely shocked and stunned to hear about the assassination of Benazir Bhutto. This is what terrorism has done to a brave and gutsy daughter of Pakistan.Her opponents have a lot to say about her but I greatly admire her courage and stand against terrorism and despotism.A woman who became Prime Minister twice at a very young age in a fundamentalist male dominated society. She was liberal and pro-democracy and against terrorism. She paid a heavy price for it. We are grieving for her, her family and Pakistan which is in turmoil.Saw the live coverage of her funeral this evening. She was laid to rest beside her father who was hanged by a military dictator and her two brothers who were killed. Salman Rushdie has based his novel Shame on the life of her father. Sonia arrived in the evening with Abner.She brought us gifts and so many edible goodies that we have not stopped eating.Think I've gained 5 pounds.Abner (6 years)is sharing all his snacks with me and Sheeba is very excited as she is getting some. Found this on the aol website.Here are excerpts. In retaliation, some people attacked a church, set it on fire and attacked a vehicle at Baliguda town.The trouble had started Monday morning at the Christian-majority Brahmanigaon village, 150 km from the district headquarters of Phulbani, over celebrating Christmas.While the Christian community wanted to celebrate the day in a grand way, the local Hindus opposed the plan, Bhol said.This led to clashes between the Hindu and Christian groups. The attack on Saraswati led to escalation in the violence. Saraswati has his ashram in Tikabali.Although more than 1,000 policemen were deployed in the sensitive places Tuesday they could not reach many of the trouble spots as bandh supporters had blocked the roads leading to the villages with logs.Two companies of paramilitary forces and extra police force have been rushed to the area to control the situation. Besides the VHP bandh call, the local Kui tribal community had also given a shutdown call demanding immediate solution to their problems.The clashes took place mostly when bandh supporters attacked shops in various places.People of both communities have lodged police complaints against each other.Four people, all Hindus, have been held for inciting communal tension in the region. Besides, at least nine people have been arrested for attacking Saraswati, a police official said.According to reports, shops were closed and vehicular movement affected in places where the clashes had taken place as the VHP shutdown came into effect.Phulbani is considered one of the most communally sensitive districts in the state with numerous clashes reported between Hindus and Christians in the past.The VHP, which has called a press conference in Bhubaneshwar Wednesday, has claimed that its bandh was a grand success.The Congress has blamed the VHP for fanning communal tension in the state. Bhubaneswar, December 25: Curfew was imposed in some areas of Orissa's tribal-populated Kandhamal (Phulbani) district Tuesday night after over a dozen people were injured in clashes between Hindus and Christians in the wake of a shutdown called by the Vishwa Hindu Parishad (VHP) to protest an attack on a Hindu leader. Unconfirmed reports said one person had died.The curfew was imposed in the troubled regions of three police station areas in Baliguda, Daringbadi and Phulbani town of the district, over 200 km from the state capital, late Tuesday evening.The situation is very tense and top officials, including the district collector and the district police chief Narasimha Bhol, are camping in the area.According to reports reaching the state capital, protesters attacked the house of the brother of state Steel and Mines Minister Pabmanabh Behra at Firingia in the district and torched a vehicle belonging to the minister.Three churches were ransacked and burnt in the district, local sources told IANS on phone.Two police vans and two private vehicles were burnt in Tikabali village while hundreds of people blockaded roads at Adabadi to prevent vehicles carrying the Orissa state armed police from reaching the troubled spots. There are reports that one person was killed in the communal clashes in Barakhama, but police have not confirmed it.Sporadic clashes were reported from villages under three police stations in Daringbadi, Brahmanigaon and Tikabali police station areas. Chief Minister Naveen Patnaik has appealed to the people to maintain peace.Over a dozen people were injured in the clashes, Bhol told IANS.The four-hour VHP bandh was to protest an attack Monday by a group of people on the vehicle of local Hindu leader Swami Laxamananda Saraswati near Daringbadi when he was on his way to perform a yagna there.Saraswati and a person accompanying him were injured and their vehicle partially damaged, Bhol said. Bhubaneshwar, December 26: Hundreds of police were deployed in Orissa Wednesday as Hindu hardliners burnt and damaged 12 churches in communal clashes, killing at least one person, police said.The reported injury of a local Hindu leader by a Christian group Monday sparked two days of violence over Christmas in the Kandhamal district of southern Orissa by hardliners who accuse Christian groups of converting low-caste Hindus. "The situation is tense but under control," said B.B. Mishra, a state inspector-general of police.The hardliners, some linked to the Bharatiya Janata Party (BJP), have often accused Christian priests of bribing poor tribespeople and low-caste Hindus to change their faith.Many of the churches targeted were makeshift places of worship, often built with thatched roofs and mud walls, local media reported.Orissa, now governed by a BJP ally, has witnessed some of the worst attacks on Christians in the past, including the murders of Australian missionary Graham Staines and his two children who were burned to death inside their vehicle by a mob in 1999.Christian groups say lower-caste Hindus who convert do so willingly to escape the highly stratified and oppressive Hindu caste system.But several states ruled by the BJP have passed anti-conversion laws. 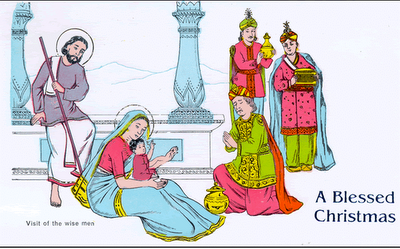 Christians make up around 2 per cent of mainly Hindu India's 1.1 billion people. While everyone was sleeping I set up my Christmas decorations on Christmas Eve. The nativity scene is a collection of odds and ends collected over the years since we were children.The sand stone carvings are from Nigeria.And the Noah Ark animals from all over the world. This ebony wood carving nativity scene is from Malawi which our missionary friends from Canada gifted is. I have it up all year round..
Christmas is also known as bada din or big day in North India.Many blessings to all my friends and readers on this great day. A friend visited with his American wife and brought us this basket of goodies...cookies candy and nuts. 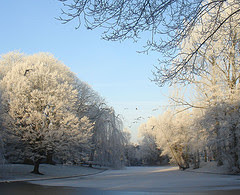 Is it snowing in Allahabad? Just kidding...dust particles reflected in the flash. Busy making festive snacks called pakwans.I wanted to bake my own fruit cake, but Mom ordered them from the baker. But I 'll make doughnuts and ginger cookies. Now I 'm off to buy fish as we have our Christmas potluck after church tomorrow and I will bring fried fish.Before that we will have everyone for tea at our place.I have to wrap gifts and goodies to give to our servants and helpers. Missing my sisters and family so much was nearly in tears this morning. But God is good. He reigns! 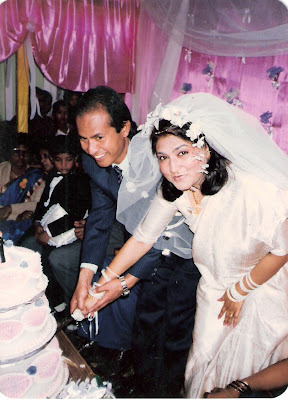 Namrita on her wedding day. They have two sons 8 and 10.They are both miracles.She has thyroid problems and could conceive after a lot of treatment.The Lord blessed her and she concieved her second son without any treatment. they live in Meghalaya in the North East of India closer to the Bangladesh. Namrita is a painter,singer and a very good housewife and mother. She is as her name means- gentle and patient.She is such a perfectionist that she cleans the whole house before going to bed. Everything has to be just right. We used to tease her..."Are you expecting guests in the middle of the night? Relax." But its her way.Everything has to be just right. She was headmistress of an elementary school. But after the kids were born, she wanted more time for them so she opted to be a teacher. 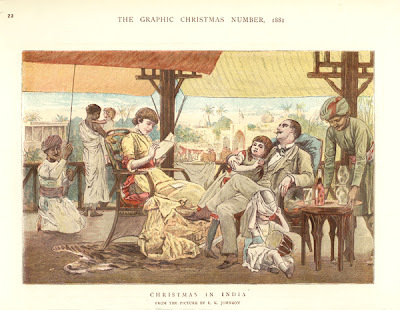 Christmas in India"; chromoxylograph from a drawing by E.K. Johnson; 1881. An idealized picture of British home life: attentive servants and happy children (who would be packed off to England for schooling before long). You can see the ayah - children 's nurse, a man operating an overhead cloth fan or punkha . My parents had these in their bungalows before electricity came to their area.My mom recalls that during the hot long afternoons when my grandparents who were both doctors were away at the hospital the children would force the punkha man to let them operate the fan against the orders of the sahibs. But it was fun for them. In the painting you can also see a bearer or butler serving cool drinks.Do you think that 's a tiger skin under the lady 's chair? Hundreds of the big cats were hunted.My grandfather shot one, but it was a maneater and he was asked to do it by the authorities.My Dad was a hunter too. He brought us game when it was permitted, but never broke the law.I must tell tell you how he shot a rabid wolf in our front yard, right in the middle of the city.He used to shoot snakes, which is quite difficult to do as they move so fast. My Pastor designed this calender for 2008 and produced a CD of Christmas songs composed by his boss, who is a renowned Christian composer.He gifted us copies of them. Thank you Pastor. Today when the lights did not go off at 10 am I was surprised. (We have daily power rostering between 10 am and 1 pm)Mom reminded me that it is the Muslim festival of Bakri Id (goat sacrifice) so the power dept was very gracious to us. I took advantage of the power supply and washed extra clothes.We have a battery operated generator but we can 't run a heavy equipment on it. Today my web browser is giving me a lot of trouble. Its very slow and skittish. that I got pretty stressed out by mid-afternoon. My Tanenbaum is giving me the creeps.Everytime I pass by the living room I jump thinking someone is standing there.Maybe I 'm just falling apart. Romans 8:28 "God causes all things to work together for good to those who love God, to those who are called according to His purpose." I comfort myself with that verse when disappointment strikes.But I never deny that I am disappointed. 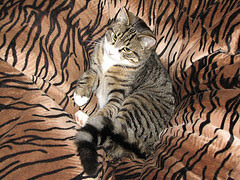 Love this little kitty.Camouflage! Waiting for Mickey. 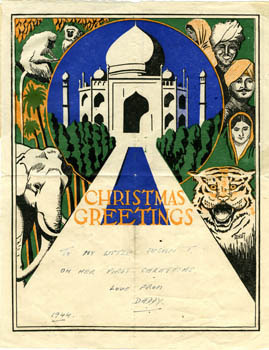 The card on top is an old Christmas card from 1946 (doesn 't belong to me). 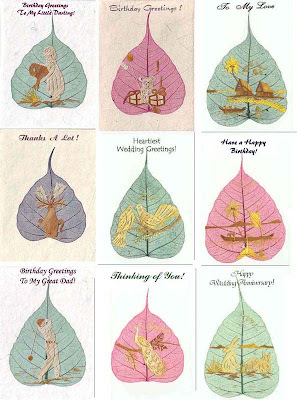 Below it are Christmas cards hand painted on dried peepal leaves. I get these from our Catholic Book shop some of them have nativity scenes on them.In Mussoorie I used to get hand painted batik cloth cards, they are very unique. I groan at the commercialization and stress of Christmas In our family w e've had moderate, but happy, holy celebrations with lots of fun with family, friends and fellowship. When we lived in a housing complex our non-Christian neighbours thought we weren 't celebrating Christmas as we were not having rave parties in our flat and dressing up in new clothes.Gave us an opportunity to witness to them and tell them what the real meaning of Christmas was.The Indian media has shown Christians in very poor light specially the movies, it was a reaction to the British Raj, I think.They wanted to portray everything connected to the British and the West as degenerate and decadent and shameful. They got plenty of examples from Hollywood too. But things are getting much better since the 90s. Christian television coming into India has done a lot of good. 99.9 % of stores and businesses closing for Christmas, Sunday, Thanksgiving, Easter, etc. Two Hindu girls visited us this morning.They are business management students and are interested in the Bible.I was busy with house chores so mama talked with them. They promised to come to church on Sunday Dec. 23rd. Remember them in prayer. Went to the meat shop before they close for the Muslim holiday break.Its funny but whenever we go for pre-Christmas shopping we bump into the Pastor of the Seventh Day Adventist Church - in different shopping centers too.Strange.Never meet him shopping at any other time. He tried real hard to influence us with his teaching and now he knows we are firmly grounded on our doctrines and know how to answer him. Took Mama to visit Aunt Maya and on the way we bought rice, lentils, nuts and raisins for our Christmas cake from a retail shop that gives a good discount. I bought a bottle of sesame oil as they say cooking in that medium keeps you warm in winter, also mustard oil. We use mustard oil a lot. It adds a lot of flavor to the food specially non-veg. On Dec. 21st is the Muslim festival of Bakri Id when they sacrifice rams and goats in remembrance of Abraham offering Issac to God. But of course they believe it was Ishmael. My maid will take 2 days off and I must buy chicken and lamb as the meat shops will be closed because most of them are owned by Muslims. The fish mongers are Hindus. Funny eh? you eat and sell meat according to your religion. The road roller/leveler came around this evening and i negotiated/bargained and settled for a reasonable hiring rate.In India you have to negotiate your price when there are no fixed rates.It takes practice, business acumen, patience and a good deal of psychology to do that.I am learning. You should know the value of the thing you are negotiating for, it should be paisa vasool as we say in Hindi or worth the amount you are paying for it. Once while shopping in a trendy tourist market in Delhi (Palika Bazar) I spotted a bottle of French perfume. The shopkeeper quoted an exorbitant price. A closer examination of the bottle revealed that it was fake. So to shake off the pushy salesman I offered a ridiculously low price ( from Rs 1000 to Rs 100) After a few turns the man came down to my price. Then i told him the expensive French perfume could never cost so little so I knew it was fake and the scent would only last 10 minutes.The man was taken aback ,but he couldn 't say anything. My friend Ginny gifted me a bottle of Poison perfume by Christian Dior, about 15 years ago and I use it very sparingly so it has lasted and still smells divine. There was a time when I thought I couldn 't manage an email and a blog was a deadly computer virus.But friends like John encouraged me and Carol-Ann gave me practical help and instruction. I like collecting funny ,crazy things which take my fancy.Got the above sheep blouse years ago.Just love the picture.Wouldn 't we all want to join our fleecy friends on a beach in sunny Goa (India 's West coast near Mumbai).We could go para gliding! What do you think of this handbag.? Needed one as my last one (20 years old) was worn out.I had been using the more ethnic bags .Thought I might do with a business style one.Its got lots of compartments inside. But the prices will go up when they see this in the market place.They check out your attire and accessories and charge you sometimes. Difficult to explain.What I pay Rs 15 for, my maid can get in Rs 5. Not fair. Creating a Bloglines account has really helped me staying in touch with my blogfriends . Log on to http://www.bloglines.com/. Found this photo on Happy LOL Day. Creepy! Imagine waking up in the middle of the night and your lamp doing this to you. Some more merchandise from the fair.Handmade shoes from Punjab and metal ornaments from the northern hill tribes. And my favourites...jewelry and glass bangles. A trip down Vanity Fair. Today I skipped church as I was feeling emotionally stressed. Needed to spend time alone . Didn 't want to pretend to be worshipping when my heart was not in it. The psalmist prayed"Let the words of my mouth and the meditation of my heart be acceptable in your sight"
But at the same time the Lord does not reject "a broken and contrite heart". He forgives us. Tomorrow is our church 's Christmas dinner at the Parsonage. For people who might be wondering how I live so close to the church. Our house is right beside the church and very close to the parsonage.In my country its quite common for Christians to build their homes around a church.The church leases land to its parishioners.This began during the British Raj.There are several such Christian communities all over our town some quite large. I have entitled this post Fair and Lovely which is also a fairness cream extremely popular with brown-shinned Indian ladies.It promises to lighten the complexion thus making the woman more beautiful, attractive and winner on the job and marriage market.But brown, black, yellow, red and white all colors are beautiful.Its the inner beauty which counts. It would be extremely boring if we all looked alike.Our Creator loves color. 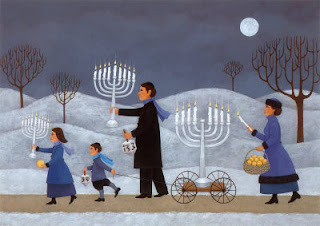 I 've been reading about the Jewish festival of Hanukka.My Jewish friend Teddy talks about it on his blog.I don 't know if it is based on an incident recorded in our Christian Old Testament. Have to research that. But I like making the potato fritters called latkes. 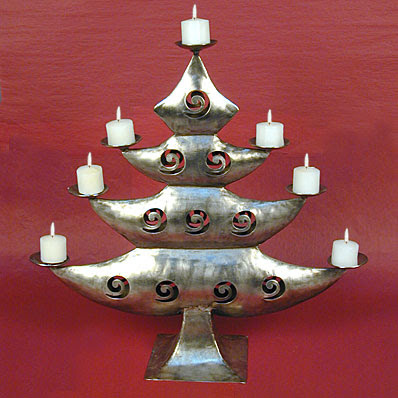 And I 'll be on the look out for for Jewish menorah candle stand. Hanukkah is an eight day holiday starting on the 25th night of the Jewish month of Kislev. Hanukkah (The Hebrew word means 'Dedication') is also known as the Festival of Lights. The holiday goes back almost 2,400 years. Hanukkah celebrates one of the greatest miracles in Jewish history. The origins of Hanukkah are an event that happened over two thousand years ago. At this time, Judea was ruled by Antiochus, a Syrian king. He attempted to assimilate the Jews into Greek culture, commanding them to worship Greek gods while oppressing Jewish culture and religion. A statue of Antiochus was erected in the Jewish temple and it was ordered that the Jews should bow down before him. The Ten Commandments forbid Jews to worship statues or idols and so they refused. A small group of Jews called Maccabees (which probably comes from the Hebrew word meaning 'the Hammerer') rebelled, risking their lives to prevent the desecration of their Temple. Although the Maccabees won, the Temple in Jerusalem was destroyed. The Jews had to clean and repair the Temple, and when they were finished they rededicated it to God by rekindling the sacred Menorah (a six-stemmed candelabrum) of the temple. 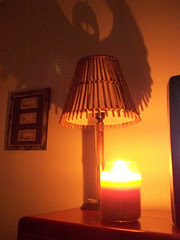 Only one small jar of sanctified oil was found, an d yet the lamp stayed alight miraculously for eight days. It is because of this miracle that Hanukkah is celebrated by lighting one candle on the Hanukiah (an eight-stemmed candelabrum) each day. 'Rock of Ages' ('Moaz Tzur' in Hebrew), a hymn of praise to God, is sung after each night's lighting of the candles. The Hanukiah symbolises how God looked after the Jewish people at this difficult time. Like Christmas, Hanukkah is a special time for children. Gifts and Hanukkah money are exchanged. Some families give a small present on each of the eight nights of Hanukkah. Children and adults play with a spinning top called a dreidel. This cube-shaped dice has a Hebrew letter on each side. 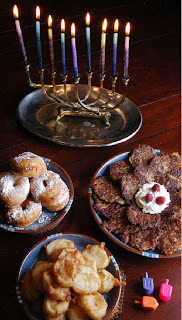 Some dishes have special significance, such as latkes (a kind of potato fritter), pancakes and doughnuts. This is because they are fried in oil and so Jewish people remember the miracle of the oil lasting eight days in the temple. My country has close ties with Israel. We get a lot of tourists from there, many of them interested in Eastern religions. In the Word we are exhorted to pray for the peace of Jerusalem and salvation of the Jews. 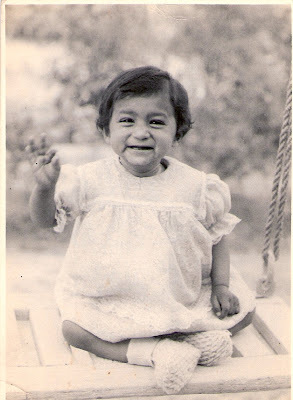 Just call a from Namrita, my younger sister who lives in Meghalaya (N.E. )Today is her bro-in-law 's pre-wedding dinner party.She was asked for the recipe of fried fish.They are doing 60 pounds(30kgs).Their culture, food, traditions etc is completely different from ours.They have a matriarchal society.Namrita had to make a lot of cultural adjustmentments when she married my BIL.But the Garo people love her,they appreciate the way she has adapted to their society. 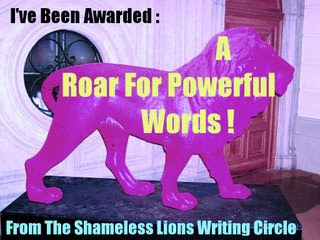 The award was started by the Shameless Lion Writing Circle and is "the chance to scream from the mountains the good news about the powerful posts that are produced every day in the blogosphere, despite what some mainstream columnists and journalists claim. I started my blog to reach out to others and make friends and tell people about my life and church ministry.I like to write on religious, social, political and cultural topics with a garnish of humour.I am learning from you all. Actually my family name is Singh which means Lion in Hindi.But I would like to be known as a lamb of the Good Shepherd. roller will level it.We need lots of water to settle the dirt and the Lord sent us a rain storm and some rain last night to help us on our way.Thank you Jesus. I am claiming the Promise from Isaiah 40;4,5.Singing along with Handel 's Messiah.Listen to Jon Humphrey sing it. Of course Isaiah. is talking about 'clearing way for the Lord ' v3. But as the same time we can ask Him to remove the hills and level the valleys in our lives. Then the glory of the Lord will be revealed. Our garden is doing so well. God be praised. This is hilarious. 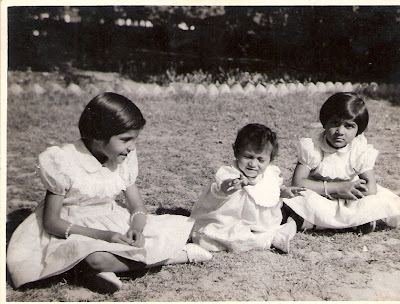 Just click on the above link and watch an elf dance ...Sheeba, my niece, Mama and me. Mahima will kill me for this . But I like taking risks . Took my life in my hands. Try this folks. Good fun. Oh Mahima that dagger looks real...arrrrrrrggggggghhhhhhh...glug...glug. Just kidding she lives light year footsteps away. P.S. I showed Mama the graphic and she was very tickled and laughed a lot. Really enjoyed it. And when Aunt Sybil heard us laughing she also wanted to have a look, but she was in bed, so she said she will look at it tomorrow. Today Aunt S had 2 lunches.I gave her lunch at the usual time and an hour later said came into the kitchen saying she hadn 't eaten and wanted to have food. We told her she had had her lunch, but she was not convinced and got angry. So I simply gave her some more. Sometimes she does forget she has eaten. Has anybody else had this experience with elder care? Just got a call from a cousin in the UK ...marriage problems. Today we had a heavy rain storm in the afternoon.Which is good for our contruction work. We are pouring dirt to lay the road and the rain water will settle it so it will be easier for the road leveling machine (roller) to do its job. The Lord has promised in His Word that He shall make the rough places smooth. Handel remembered that while composing "The Messiah". I love that song. And the rough places smooth. Today I took Mom, Aunt S and Aunt Virginia to the Treasury Office for their pension (social security) work. People at this office were very kind and good. They deal with senior citizens , so I suppose their hearts are soft towards them.The man from the bank has still not given me a receipt for the forms submitted. This office is on the 6th floor of a commercial complex and I was teasing my old ladies saying I will take you all to to a beauty salon for a make-over. None of them hardly used any make up, except my Mom who put on lipstick when she was young. On the way back Mama bought a nice cardigan (front open) and a thermal wear.And I bought veggies. I have some pictures of Momos being prepared at the Handicraft Fair.you can s ee the traditional Momo steamer and wok.I just use my ordinary utensils, they work well.You can have have steamed or fried. I like them steamed to avoid the oil. We had morning service and a prayer meeting at 4 pm. After which I went to the Bible College Christmas Carol service. This service (other churches als o have them) is called a candle light service as i t ends with a candle light procession. Above is a part of the audience and the open air candle light procession. The Sunday School children set up a manger scene on the lawns. The girls are dressed in the different ethnic clothes we have here.Seated on the floor is a group from the Punjab, they are singing a qwwali, which is a lively poem sung in a Muslim style.The Naga choir is dressed in their traditional handwoven shawls and skirts from North East India.And also a drummer and singer from Mizoram.After the service everybody had coffee and cake. The clock is my dictator. I shall not rest It makes me lie down only when exhausted. It leads me to deep depression.It hounds my soul. It leads me in circles of frenzy for activities sake. I will never get it all done, for my "ideal" is always with me. Deadlines and my need for approval,they drive me. They anoint my head with migraines. My in-tray and in-box overflow. And I will dwell in the bonds of frustration and desperation forever. Lord help me to stay close to your Psalm 23 for me and not mine. My Psalm 23 leads to destruction;yours leads me to peace,and all the good things you want me to enjoy in life. Amen.